It’s time for some AA (Audience Augmenter) posts in 2014 thanks to a lead from The Golden Trouts. They sent me a great link to a promotion the Indian’s Class A affiliate, the Lake County Captains, are running August 1st. The first 1500 fans get an AWESOME Jobu bobblehead. 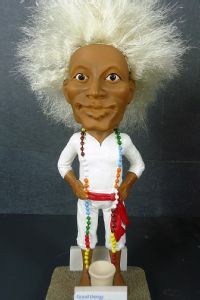 I think one of our teams, Jobu Needs ANOTHER Refill, needs this on their desk as a team mascot. 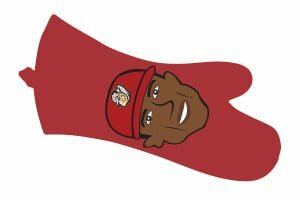 Starling Marte Oven Mitt – Altoona Curve June 1st – Unfortunately, you missed out on owning this one of a kind oven mitt. I mean who wouldn’t want to remember a struggling CF every time they pulled their casseroles out of the oven? Door Mat – Colorado Springs Sky Sox June 1st – Again, you may have missed this giveaway and what better way for a fan to remember that their team is in last place in the standings and being walked all over. Thus making them the division’s door mat. Mystery Star Wars Bobblehead – Lancaster JetHawks June 14th – What’s better than useless crap? Mystery useless crap. I will feel very bad for the fan that receives a bobblehead of Jar-Jar Binks. Bible Bobblehead of First Wise Man – Nashvillle Sounds June 29th – For a team affiliated to beer drinkers, I’m a little surprised by this giveaway. Don’t worry, you have the chance to own all the wise men in bobblehead form. Just don’t miss one of the other two games because I’m sure you won’t be able to find these cheap on Ebay. Your best bet may be to steal them from someone’s Nativity Scene this December. Free Beer and Hot Wings Bobblehead – West Michigan Whitecaps June 19th – Uh? Why didn’t they just stop after the word ‘Wings’?! Why did they have to add the word bobblehead to the end? Imagine how many fans (and college students from across the country) they could have had in attendance if Free Beer and Hot Wings were on the menu that night. It would probably go over worse than the Cleveland Indians’ 10cent Beer Night. 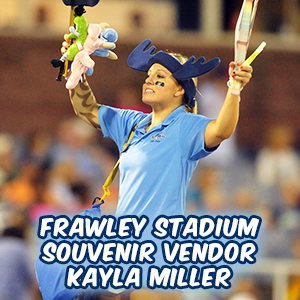 Kayla Miller Vendor Bobblhead and Cowboy Monkey Rodeo Bobblehead – Wilmington Blue Rocks June 10th and 26th – I’m pretty sure this organization is giving away gifts at every game this season, whether it’s salt and pepper shakers or umbrellas or dog bowls. But two unique ones are the bobbleheads for their local stadium Kayla Miller and another bobblehead of the cowboy rodeo monkey. First, the Kayla Miller bobblehead is interesting and let’s be honest, who wouldn’t want a collectible bobblehead of themselves. But having 1000 other people having a mini statue of you on their mantle is a little creepy (or even creepier, in their bathroom). 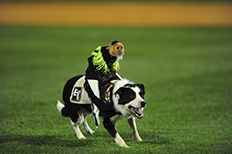 The cowboy rodeo monkey bobblehead is crazy awesome if Whiplash (the Monkey) actually makes an appearance. This isn’t the first time we have highlighted Whiplash in an AA post, and I’m sure it won’t be the last. Keep sending me those interesting links. I only have so much time to find them myself.